I have previously reviewed the Snuggbuds SP-X and found them to be quite good to listen to and to run with. When talking to the fine folks at Snuggbuds at the run expo for the NYC Half Marathon, they gave me a pair of their Pump’d earbuds to see the latest revision of their headphones and see how they have improved over their predecessors. The first thing I noticed is how much nicer the new headphones looked. 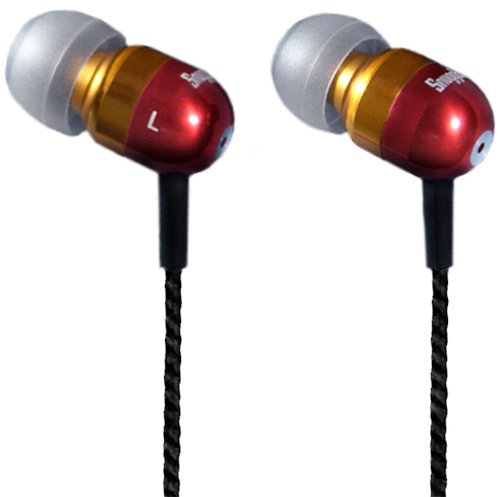 The earbuds were chromed with colors inspired by The Avengers. While they had such colors as Hulk Green and Captain America Red, White, and Blue, I had to go with my Avenger of choice and technological marvel Iron Man, with a red and yellow color scheme. The cables were wrapped in fabric that severely reduced wire tangle, which always is the bane of my portable music listening experience. The earbuds are pushed into the ear and twisted, which create a suction in the ear canal. I found that most of the time the earbuds would stay in place while I was running, but if I didn’t do it exactly right, the rubber earbuds would slide out and need to be fixed in place again. The earbuds did stay in place if given a light tug, but a strong pull, like catching the wire on something, would forcible remove the headphones from my ears. The Pump’d earbuds give a much fuller sound than the SP-X headphones I previously reviewed. The Pump’d have much better bass and an all around better s than the SP-X. Since most running headphones are more about how they hold up when running than how they sound when running, the Pump’ds are some of the best sounding running headphones I have tried. When the Suggbuds Pump’d earbuds are in the ear, there is one issue to be aware of. With the Snuggbuds firmly inserted in the ear, it dampens all outside sounds. This great for when listening to music, but can be a major issue when running if someone is wearing these outdoors in public. I often run on streets and sidewalks, so I need to be aware of my surroundings at all times, and doubly so when wearing the Snuggbuds. It’s important to be aware of this when considering traffic and other runners when getting out there wearing these headphones. Overall, I really like the sound of the Snuggbuds Pump’d headphones. I think they are good sounding earbuds that stay in firmly in place when running, but the sound dampening can be a major issue depending where you run and how aware of your surroundings you need to be.